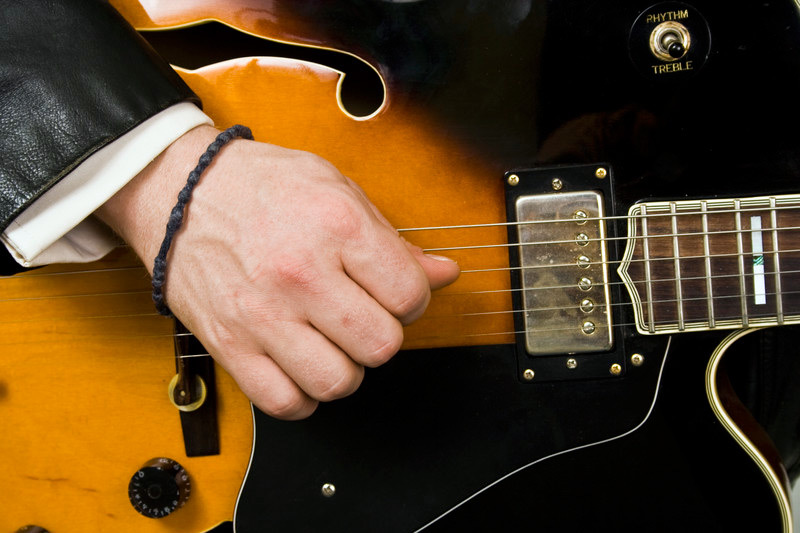 This particular way of strumming is not the only way to strum, but after observing many guitar players, it is very common. Some supination and pronation of the wrist is also common, but less so. (This motion is used when we rotate the forearm.) Flexion and extension (bending the wrist so that the palm or back of the hand are brought closer to the forearm), usually combined with pronation and supination, are less often used - though I've seen some guitar players who are brilliant at using this type of wrist movement (Al Di Meola comes to mind). For this web page article, I want to focus on ulnar and radial deviation - arguably the most important aspect of strumming - and leave the other kinds of wrist motion aside for now. The reason that ulnar and radial deviation works well is because it allows the pick to travel perpendicularly to the strings. Because this idea can be confusing, I need to be very clear here. Another way to describe it might be to move the pick "along the plane of the strings". If you put a sheet of glass on a guitar by the soundhole so that it touches all of the strings (or at least the two outer ones), and then strummed so that your pick stayed parallel with the glass, I would say you are strumming "along the plane of the strings". An ice skating metaphor might be good here: If I buried my guitar with the back down and the strings facing up (not wise), then poured ice on top of it (very not wise), I would want to "skate" my pick along the plane of the ice. (No need for a Zamboni machine at this rink!) I hope the following picture will fully clarify this concept. If you strum using ulnar and radial deviation alone, and strum along the plane of the strings, your pick will maintain roughly equal contact with all of the strings as it moves up and down. There is a caveat of course: the strings are not always installed on guitars exactly in a plane. They are actually placed in a very slight arc on most steel string guitars to match the curvature of the fingerboard - what is called the "radius". However, if you look at a nylon string guitar - a so-called classical guitar - you will notice that the fingerboard is flat, not curved, and the strings are installed along the same plane. 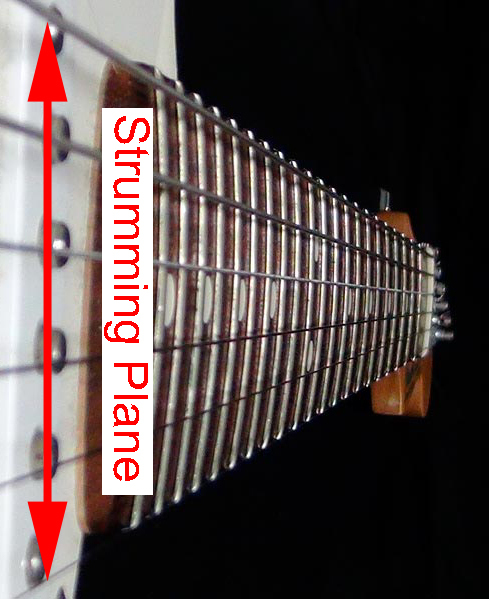 To be precise, on guitars with the strings installed in an arch, strict ulnar and radial deviation alone will probably produce a slightly louder sound on the inner strings, because the arch brings them closer to the pick, while the outer strings, arched slightly farther away, will be very slightly softer. But this is probably an almost imperceptible difference. In practice, strumming using ulnar and radial deviation should theoretically work best at producing a uniform sound. Place the side of your forearm on the end of a table or chair so that your hand is suspended in the air. Make sure that only the side of your forearm is the part making contact with the table or chair. Your thumb should be facing up, not the back or palm of your hand. Let your hand totally relax. Without rotating your forearm (pronating/supinating), or flexing your wrist (flexion/extension), lift your hand straight up, just like you are cocking it, preparing to throw a dart. Snap your hand downward, or just simply let your hand relax so that it is taken straight down by gravity. Make sure that your forearm does not move (pronate or supinate). Using radial and ulnar deviation when strumming should help you make a uniform sound on the guitar while improving your technique.